You must see this. 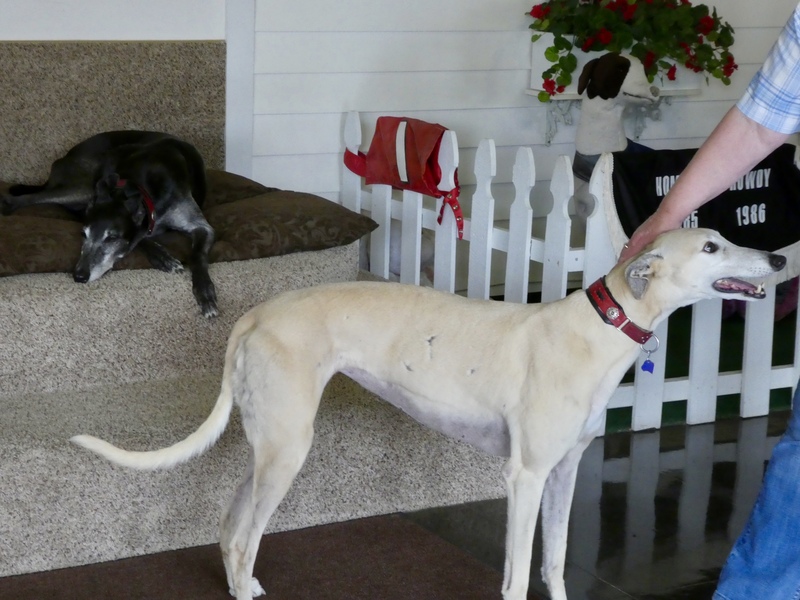 Abilene, Kansas is home to the Greyhound Hall of Fame. Dedicated to the greyhound racing dogs, this complex has a theater, meeting rooms, a museum and the Greyhound Hall of Fame displays. 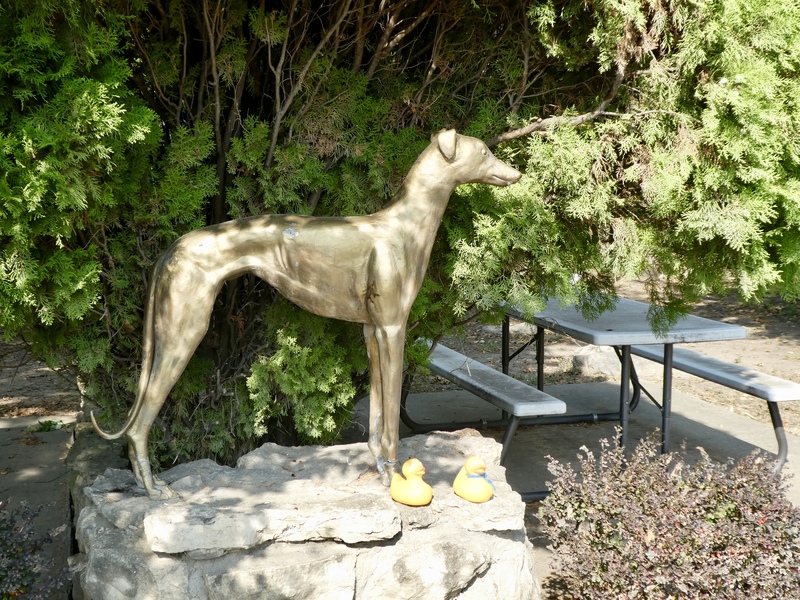 Outside we admired this statue of a greyhound. Inside we will be met by retired racing greyhounds. 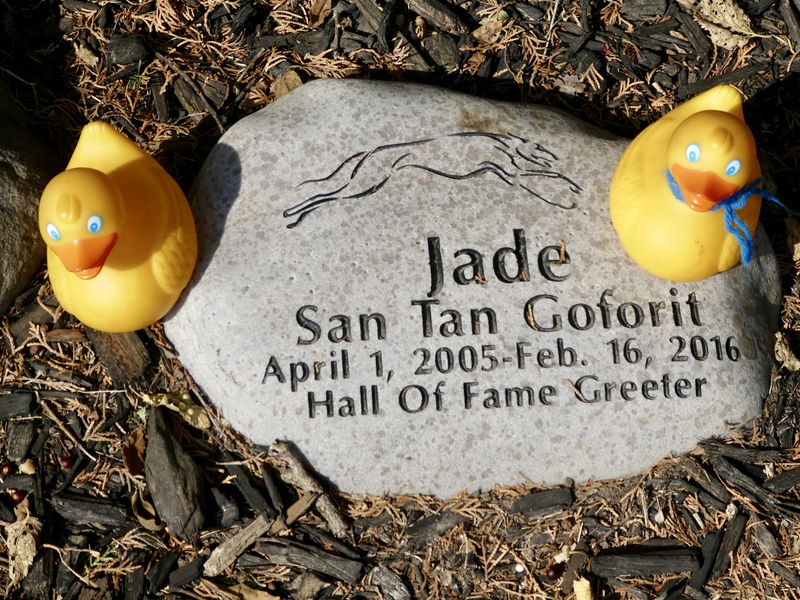 One of the former greyhound greeters, Jade, is buried here. But, let’s go inside. Gary, one of the greyhound greeters, rushed to meet us. He expects and receives much attention, much petting and much love. We had so much fun playing with Gary and Ginger, the other greeter dog. Now, Gary decides it is time for a rest. When you visit here, you will be invited to watch a short movie in the theater. We thought the movie was interesting and informative. This is from the movie. 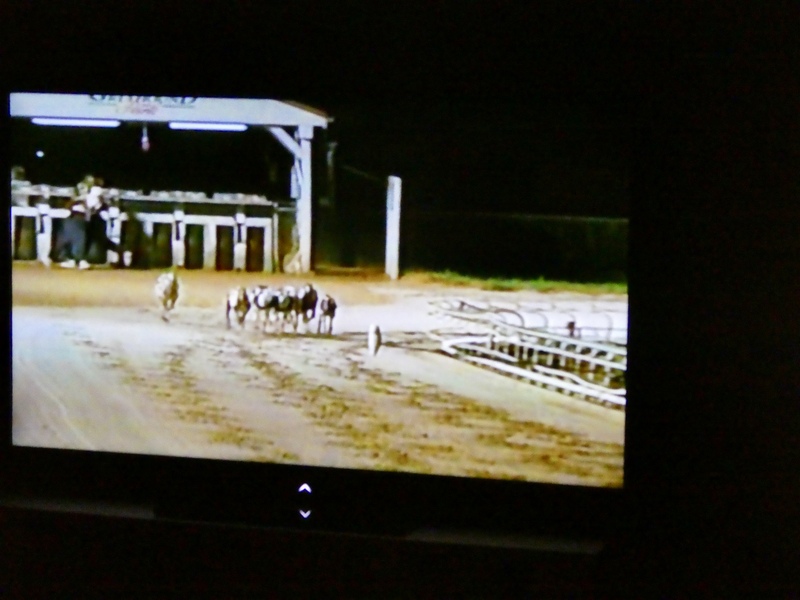 While racing the greyhounds chase a mechanical device, now based on a windsock. One of the devices is in the Greyhound Hall of Fame. 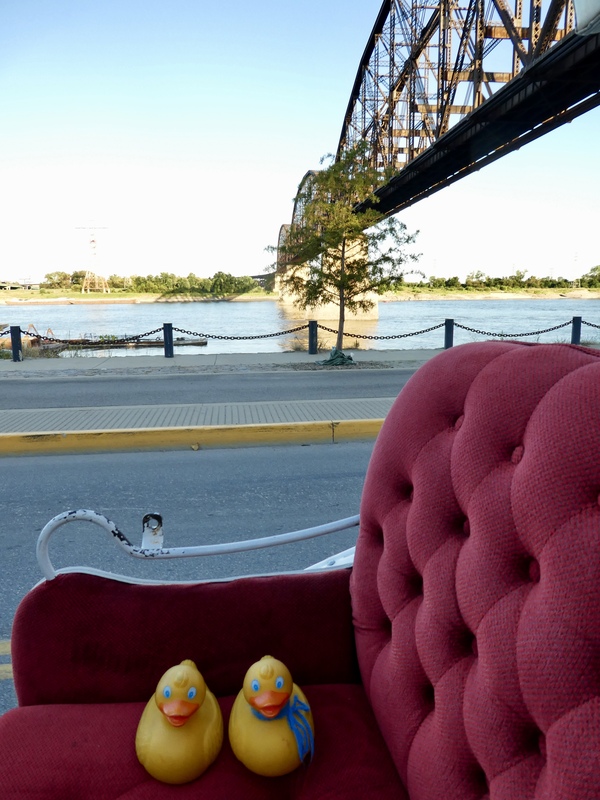 It’s pretty comfortable for two small ducks. We saw many photos of racing dogs. 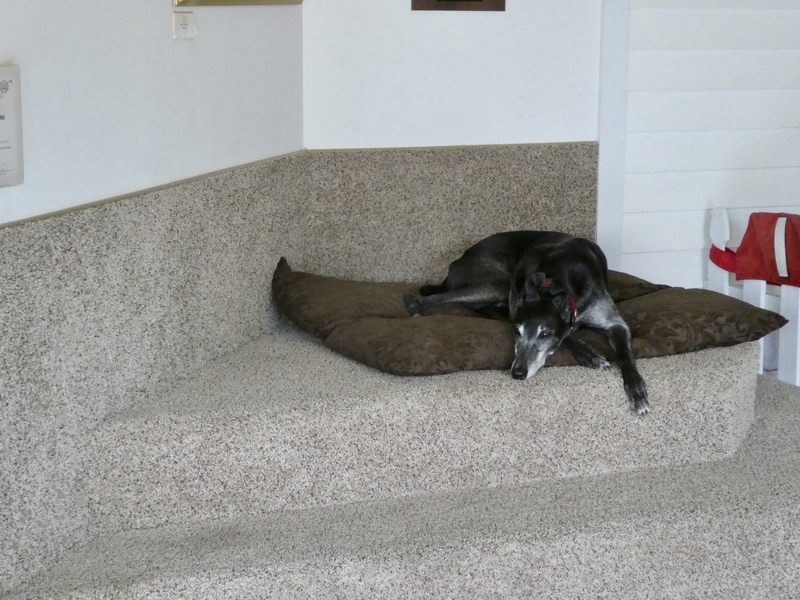 And read much information about greyhound racing. This was a nice museum and Hall of Fame. Before leaving we wanted to see Gary and Ginger again. They had been so nice and friendly when we came in. But, wait. Ginger??? That was scary. Especially for Soapy Smith Duck. But Ginger was just playing. No harm, just an experience to add to Soapy’s many stories. 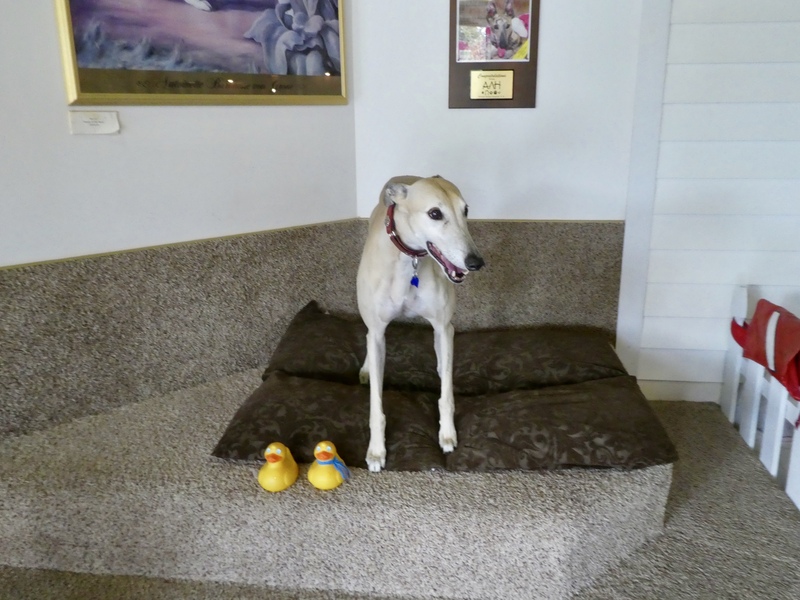 When in Abilene, Kansas, please visit Gary and Ginger and browse through the Greyhound Hall of Fame. 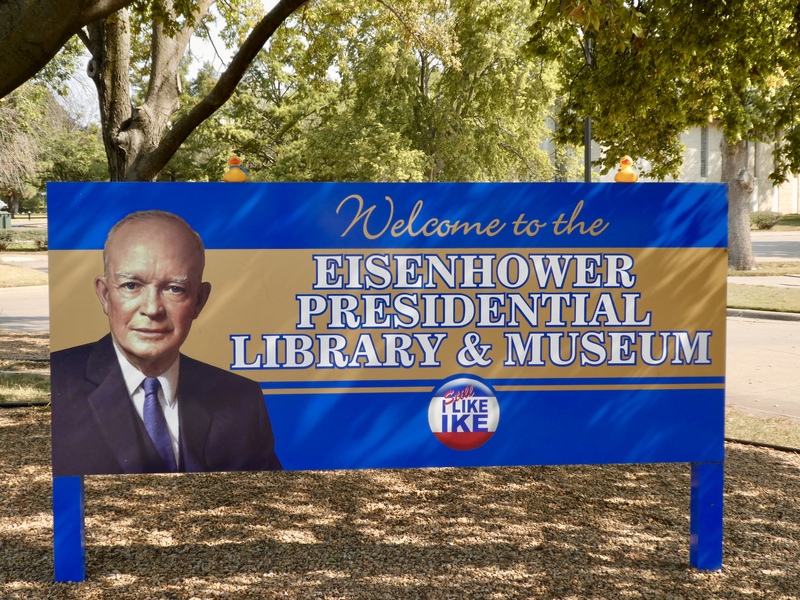 Also, across the street, is the Presidential Library and Museum of former US President Dwight D. Eisenhower. Abilene, Kansas is a nice town with interesting things to see. 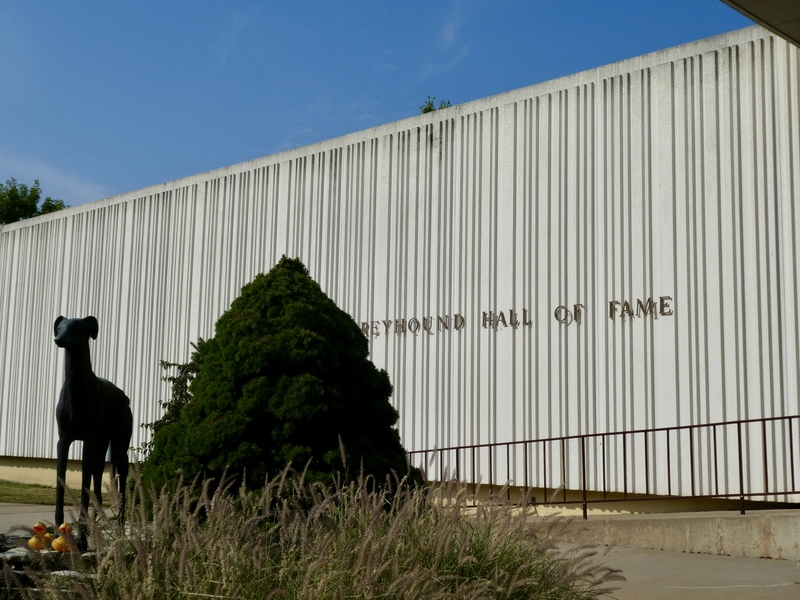 When driving on I-80, stop in Abilene, KS and enjoy the Greyhound Hall of Fame and the Eisenhower Presidential Library. After leaving St. Louis, Missouri our first stop was St. Charles. 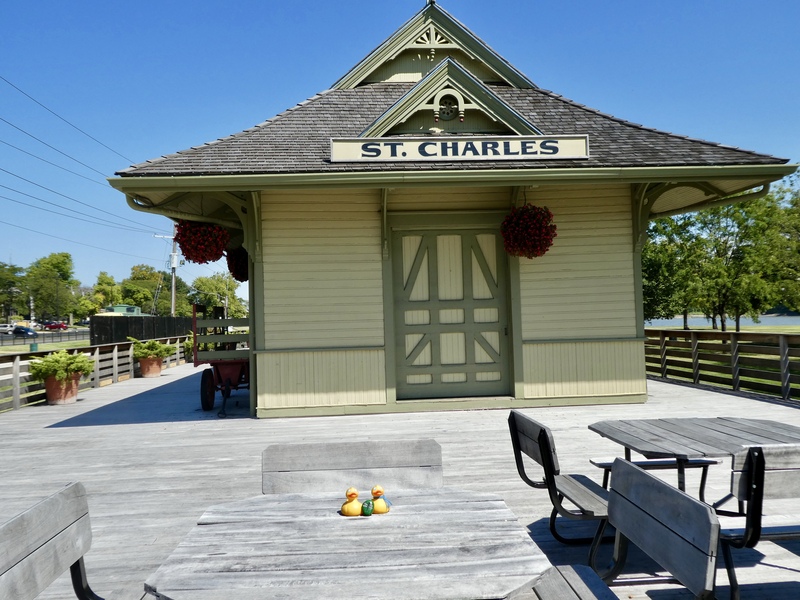 St. Charles is a pretty town located on the banks of the Missouri River. On the bank of the Missouri River. Visiting Frontier Park we explored the old train station. Isn’t this a nice place for a picnic or to sit while eating lunch. 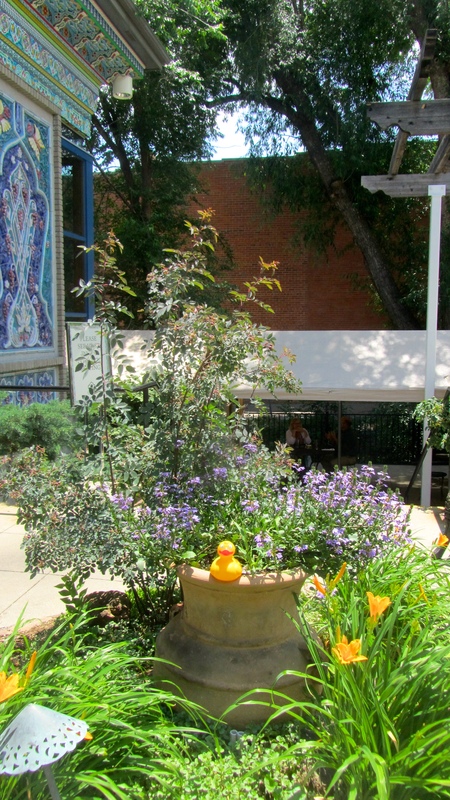 We enjoyed beautiful warm, sunny weather–perfect late summer and early fall days. 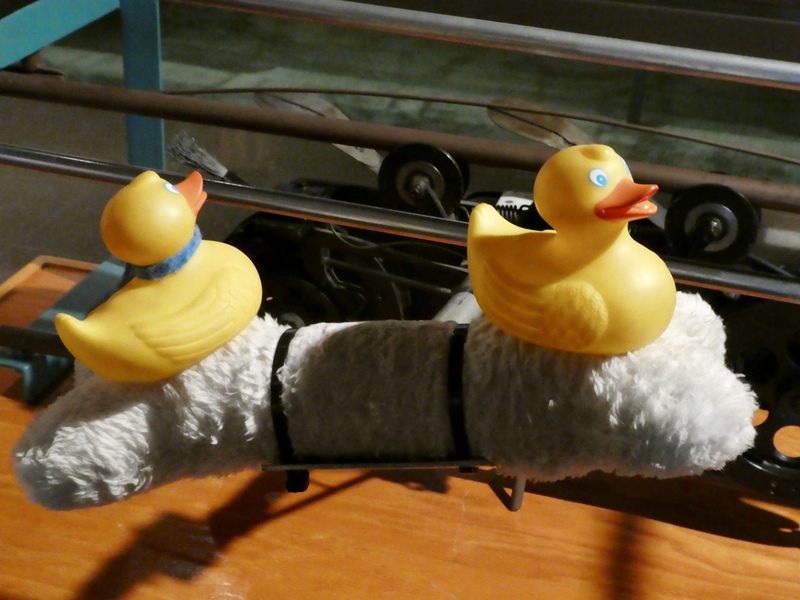 We ducks love to be on old trains. While looking at this train car, we found a painted rock. The back of the rock suggested that we rehide the rock and wait for someone new to find it. We were to post all this on social media, but we did not. We photographed it and returned it to the original location. 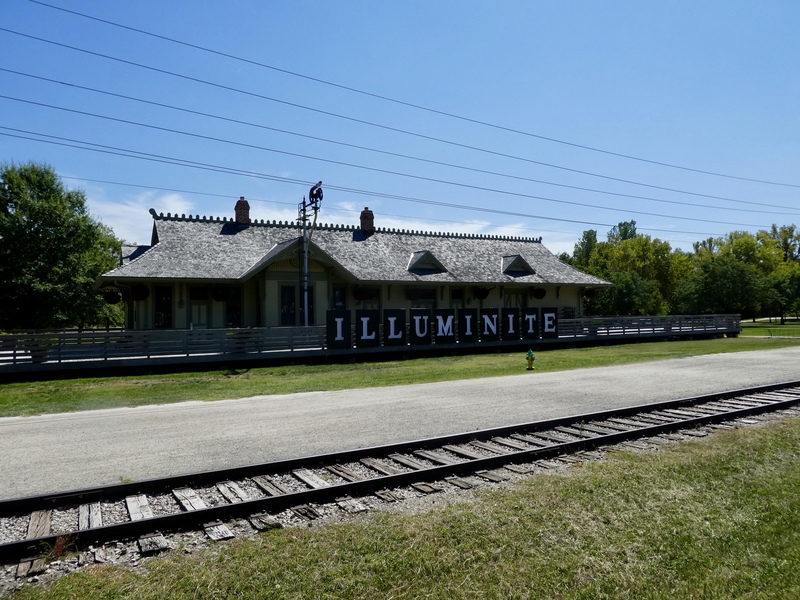 Maybe you will be the next to find it in Frontier Park in St. Charles, Missouri. This train station looked inviting. 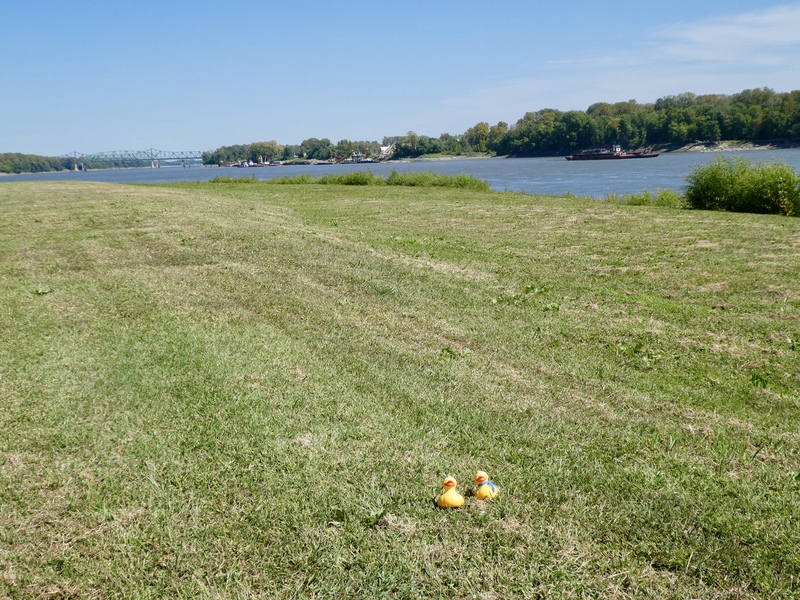 We, Zeb and Soapy Smith Duck, are between the letters U and M.
St. Charles is also famous as the starting point for the Lewis and Clark Expedition. In 1804, shortly after the United States completed the Louisiana Purchase, President Thomas Jefferson asked Meriwether Lewis and William Clark to travel through the Louisiana Purchase to the Pacific Ocean. Congress authorized $2,500 ($48,867 in 2016 value) for the expedition. The purposes were to establish US presence in the area to prevent other countries from establishing colonies here. Also to study the area’s plant and animal life and the geography. And to establish trade with the local Native American tribes. After reaching the Pacific Ocean, they were to return to St. Louis. 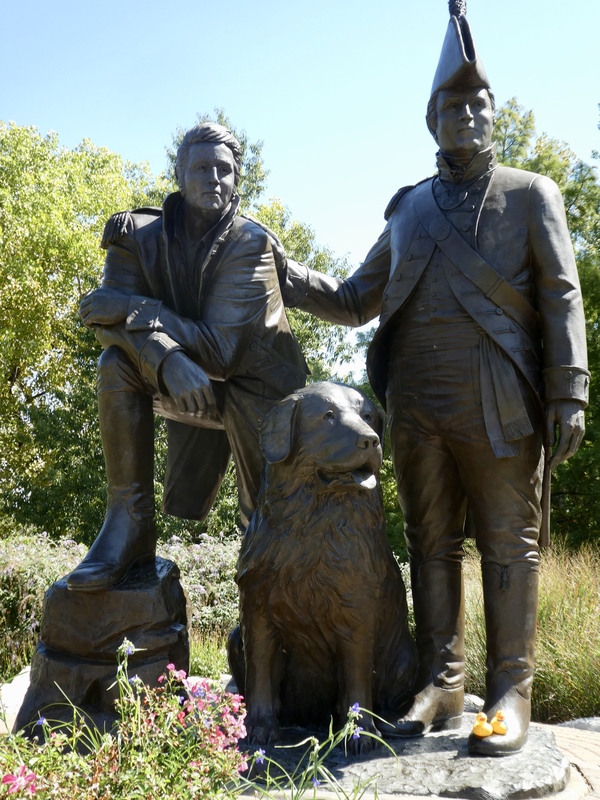 The two explorers, and their dog, Seaman, left St. Charles on May 21, 1804. They traveled about 8,000 miles (13,000 km) by boat, by foot and by horseback. Lewis kept a detailed journal and collected samples of plants and animals he encountered. Along the way they met and received help from a Native American woman, Sacagawea. October 1805 they reached the Pacific Ocean in present day Oregon. They returned to St. Louis September 23, 1806. Their journey was a lot more difficult than ours. We drove a car on I-70 and stopped whenever we needed gas, wanted food and beverages and stopped at some souvenir shops. When Soapy’s mom was very young, she and my mom, also her mom, took many road trips. They both have fond memories of Stuckey’s. This was a perfect stop while traveling. They bought gasoline, ate, did a little souvenir shopping, and savored delicious pecan logs. 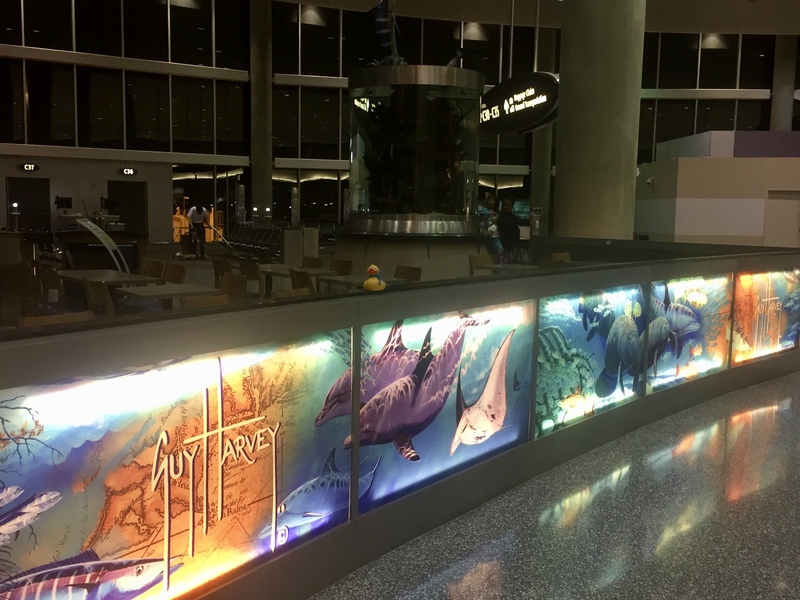 Now, unfortunately, we do not see Stuckey’s along the highways. But we were looking! Then we saw a sign for Stuckey’s. In we went. 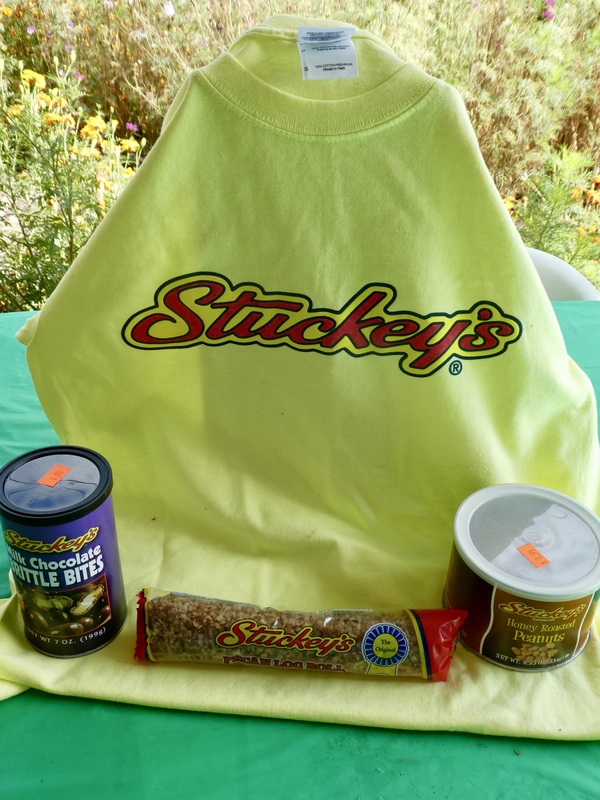 It wasn’t exactly a Stuckey’s, but another company may have purchased the rights to Stuckey brands. This was our treasure today. Hey moms, we had more pecan logs. Somebody ate them. Yummy! 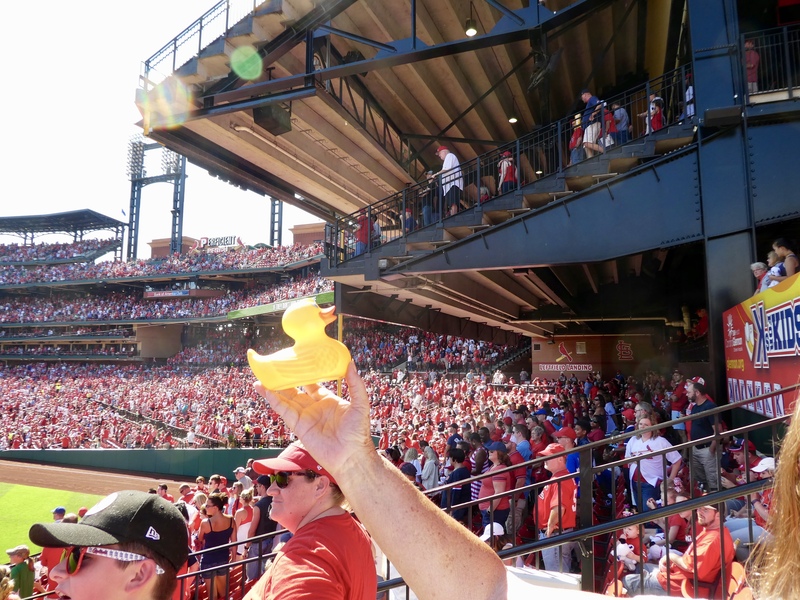 I, Zeb the Duck, and Soapy Smith Duck had part of a day in St. Louis. What should we do? We drove downtown and parked across from Busch Stadium. 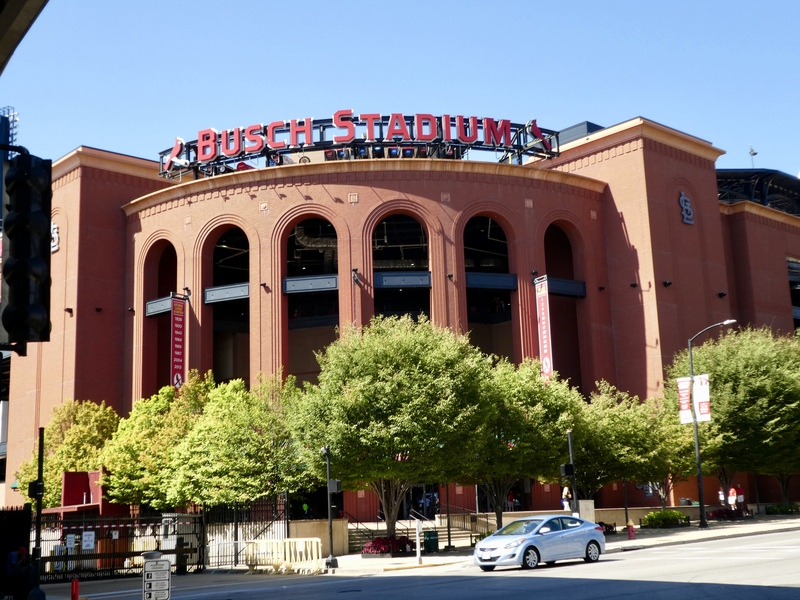 The St. Louis Cardinals baseball team plays here. 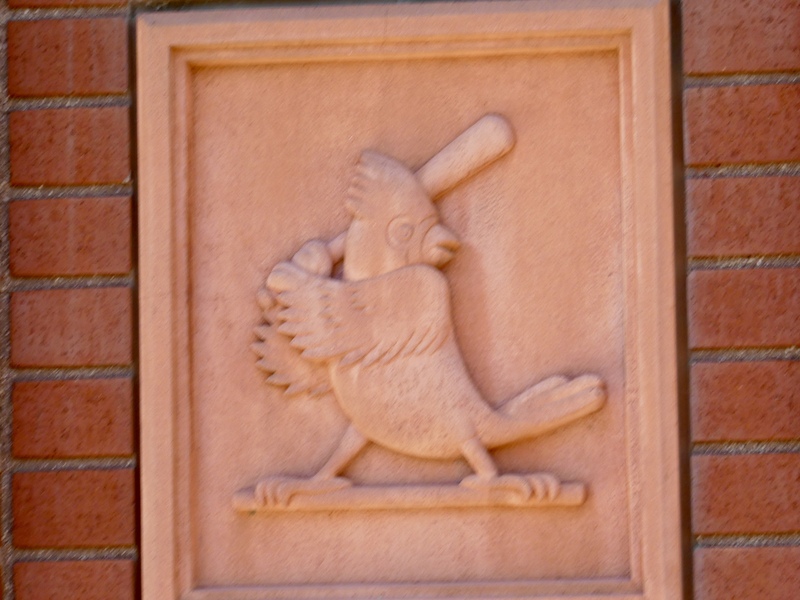 The Cardinals have won many World Series of Baseball and the fans are very loyal. Then we heard fireworks. A man on the street said that means someone hit a home run. Well, what are ducks and moms to do? We bought tickets, went into the stadium, found our seats and then bought hot dogs. For a last minute idea, we had pretty good seats. This was an exciting game. The St. Louis Cardinals beat the Pittsburg Pirates 7-0. Lots of action in this game and the crowd was happy and cheering as their favorite hometown team continued to score. 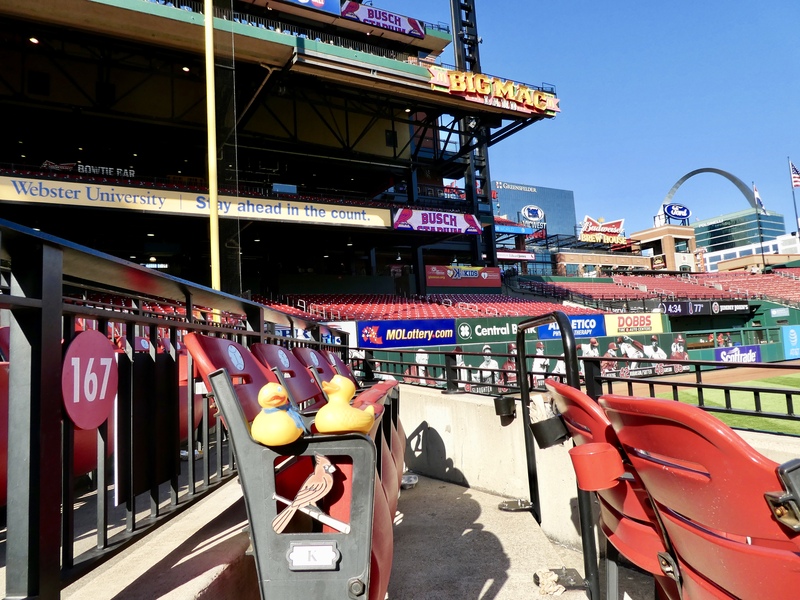 The game ended and as we left our seats, we noticed the cardinal on the end of each row of seats. Isn’t that great? We like this stadium. 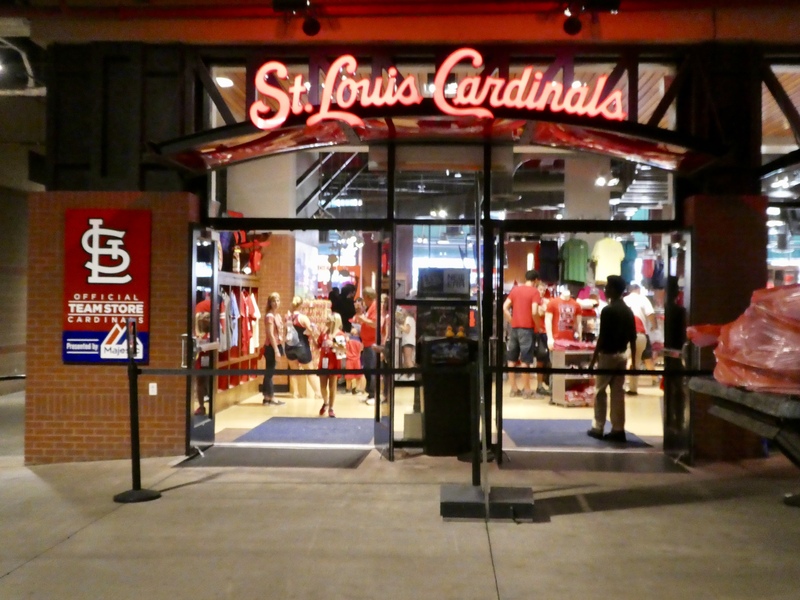 We did need to take a quick look at the Cardinals store inside the stadium. Here we are perched on a can by the doors. Outside more fans were celebrating. 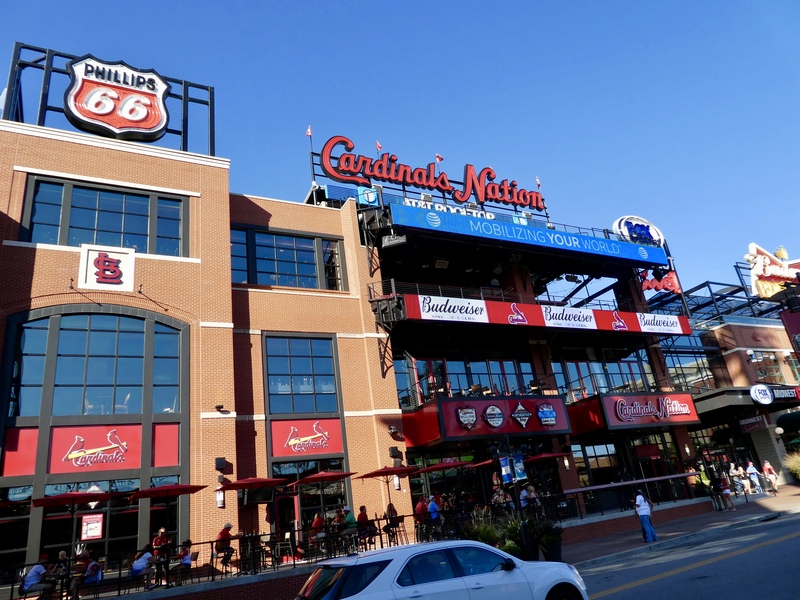 Across the street from Busch Stadium, Cardinals Nation was feeding and refreshing many fans. The weather was warm with the sun shining through the beautiful blue sky. What could we do next that would not seem like a let down after that great game? The sidewalk had the answer. 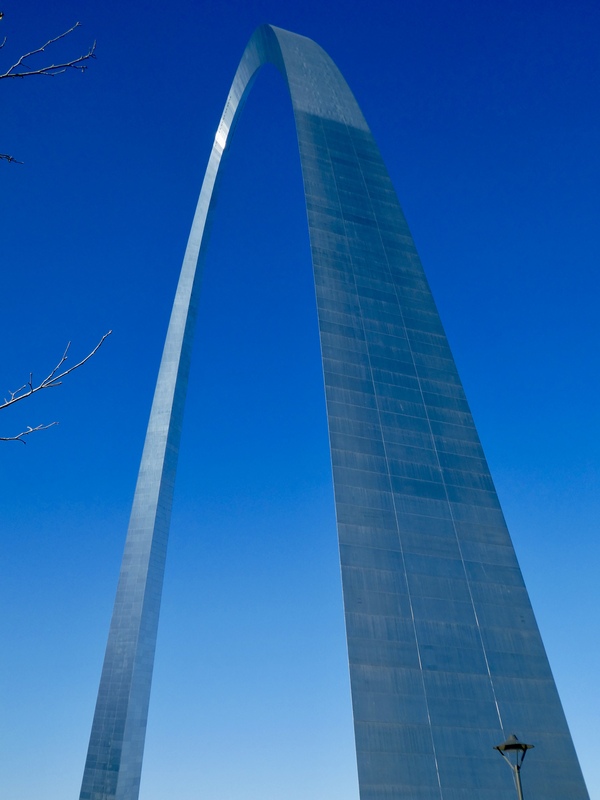 St. Louis has The Gateway Arch, the world’s tallest arch, located on the banks of the Mississippi River. The Gateway Arch opened June 1967. This, the tallest monument in the United States, is dedicated to “the American people” and a tribute to the westward expansion of the United States. Our moms have been here before and they loved this area. That is a big arch! The Gateway Arch is 630 feet tall, compared to the Washington Monument at 555 feet. The arch has a stainless steel skin and glimmers in the sunshine. 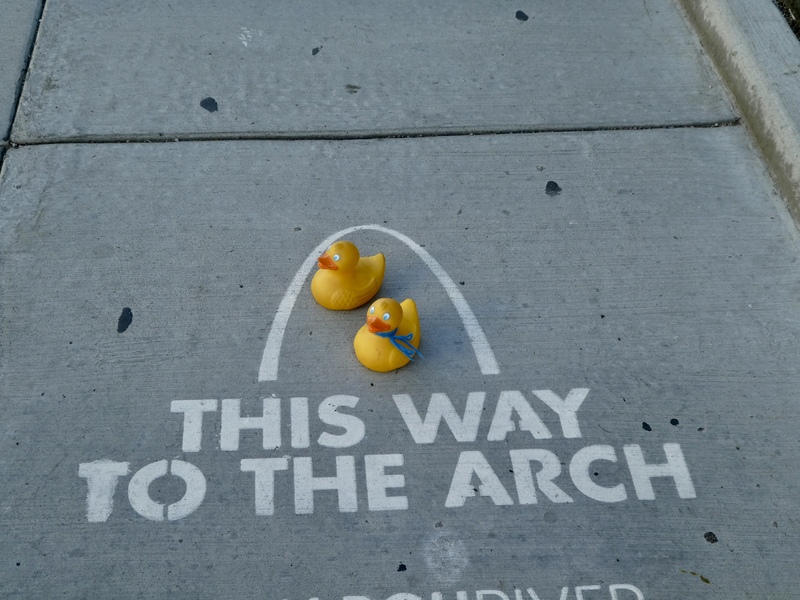 Before we ducks joined the family our moms went inside the arch to the observation area. There is a tram in each leg of the arch to go to the top. With 8 cylindrical 5 seat compartments with a small window in each compartment, 40 humans ascend at a time from each side. The cars, or compartments, swing like Ferris wheel cars, half Ferris wheel and half elevator, it takes 4 minutes to arrive at the top. At the top observation area each side has 16 windows, 7″ x 27″ (180 mm x 690 mm). 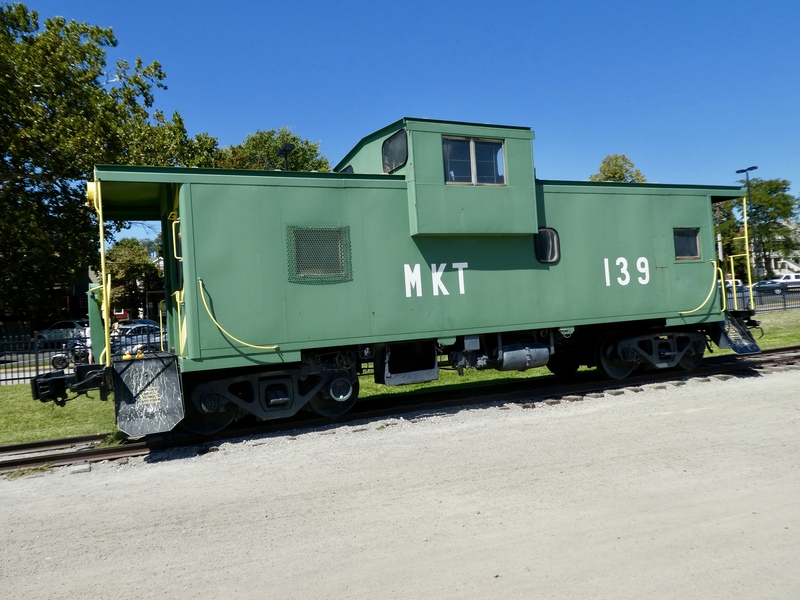 Through these small windows, you can see up to 30 miles (48 km) into Missouri and southern Illinois. We did not go inside the arch this time. Near the arch, we saw Harry. Harry pulls this carriage. 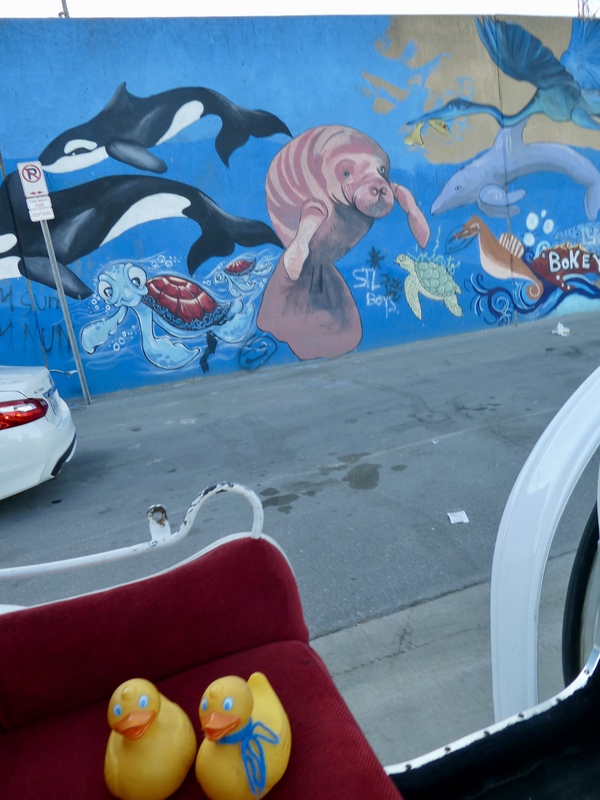 We wanted to ride in Harry’s carriage. We are riding with the Mississippi next to us. Mississippi River and bridge connecting Missouri and Illinois. That bridge over the Mississippi River goes to southern Illinois. This is graffiti wall. Graffiti wall. We love it! We enjoyed the pictures painted here. We must like artful graffiti. 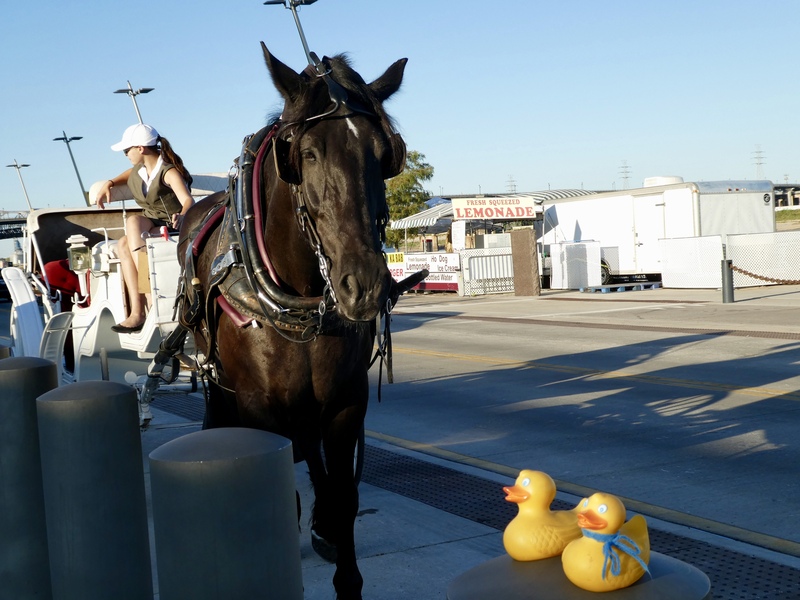 After a ride along the river and through part of downtown St. Louis, Harry, who likes apples, carrots and peppermint candy, took us to our car. We were asked not to feed Harry as he is not done working for the day. If he gets fed, even a snack, he wants to go back to the barn. So we petted Harry, paid and tipped our driver and left our carriage. Our car was parked across from White Castle hamburger restaurant. Naturally we went to White Castle for a light dinner. Looking through the window of White Castle, we liked seeing the Gateway Arch. We enjoyed our time in St. Louis. We all love Florida. 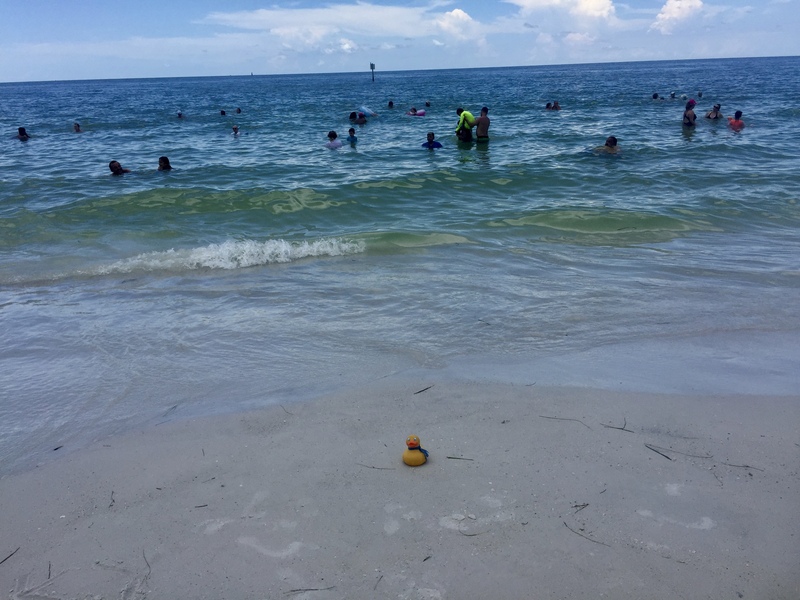 Soapy and his mom visited Florida in July 2017. Long before Hurricane Irma made landfall. Soapy here to tell about our trip. We visited friends from mom’s high school days. 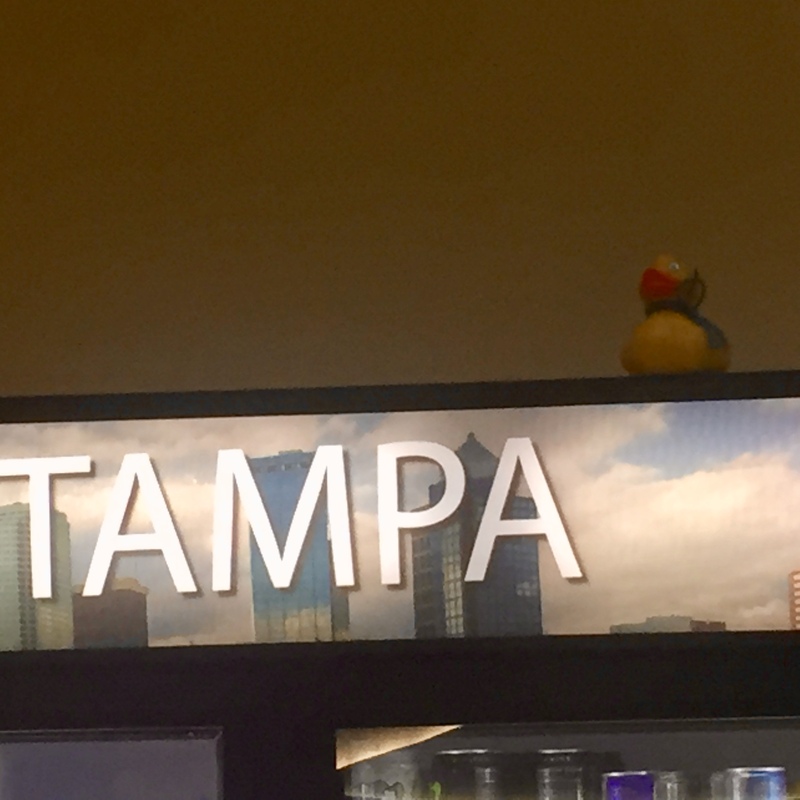 We got a flight from Denver and flew to Tampa, Florida. 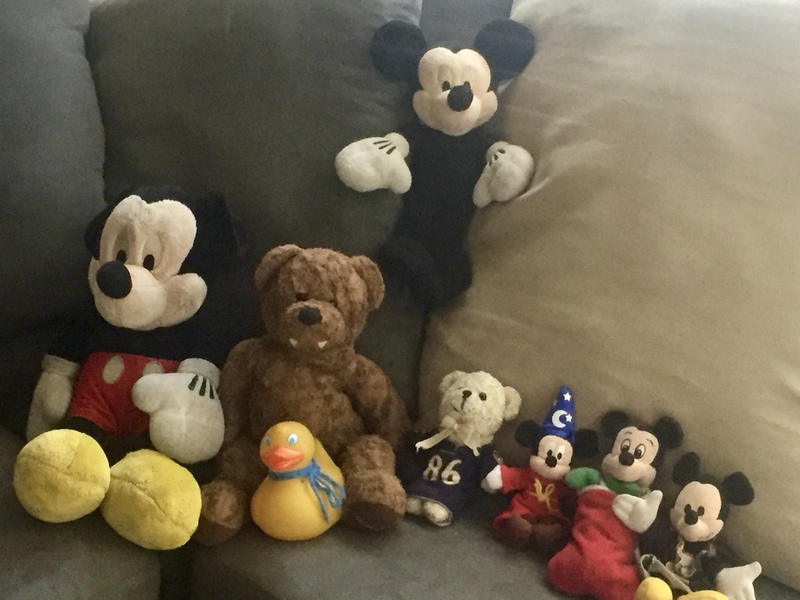 They knew I was coming, so the whole gang was there. We had such a good time. 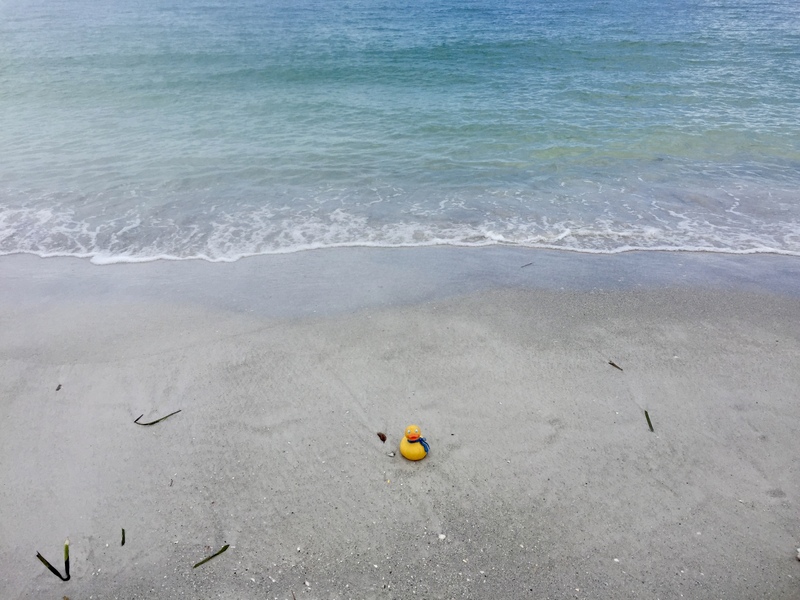 The first full day we went to the beach at Clearwater, Florida. I just love the beach. When mom was really young (before kindergarten) she used to spend lots of time on the beaches of Florida. 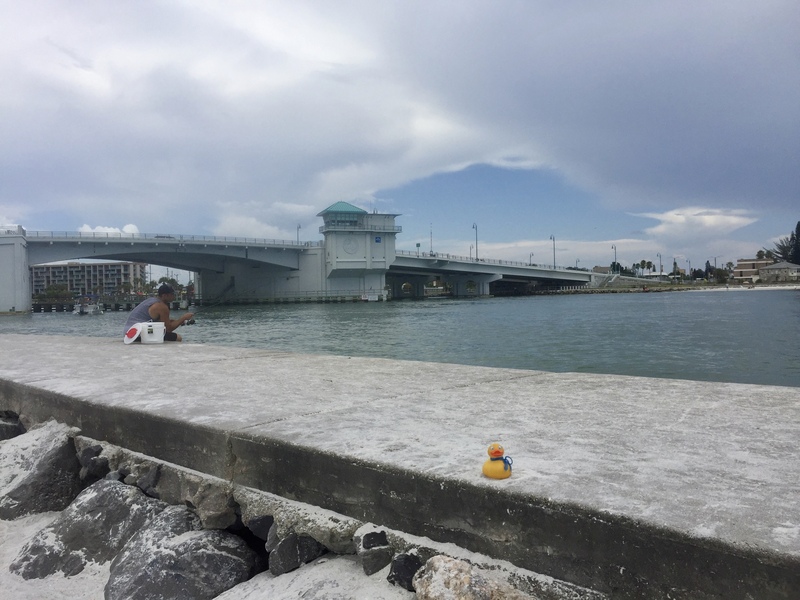 She was in Clearwater, but doesn’t remember. I’ll certainly remember this great beach. Another day we went to St. Petersburg Beach and loved the area called Madeira Beach. When we got back to Colorado we learned that mom used to stay on Madeira Beach. We loved this beach so much that we came back here another day. 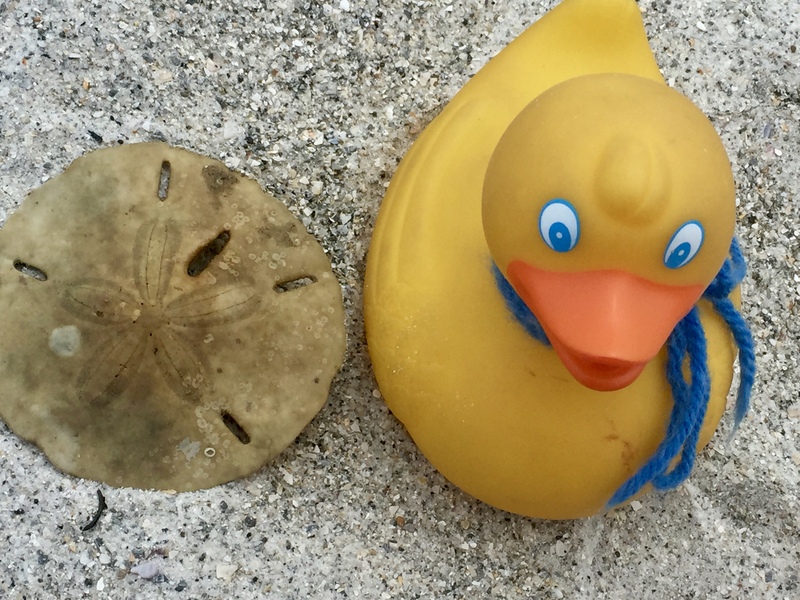 While in Madeira Beach, mom found many sand dollars. Soapy and mom found this sand dollar. This one was my favorite. Too soon it was time for our vacation to end. 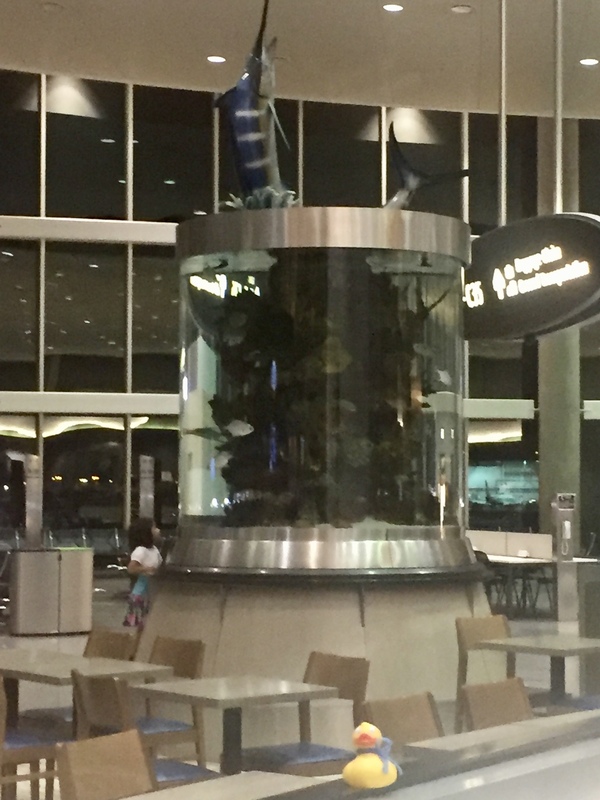 One last look at the aquarium in Tampa airport. We plan to return to Florida again. But since Hurricane Irma hit, we will wait awhile. But when Florida is ready for tourists again, we hope to be there. We love Florida and I want to see mom’s friends again. They are so nice to me. Mom talked to them right after the hurricane. They had to evacuate their apartment in Tampa, but they were safe. 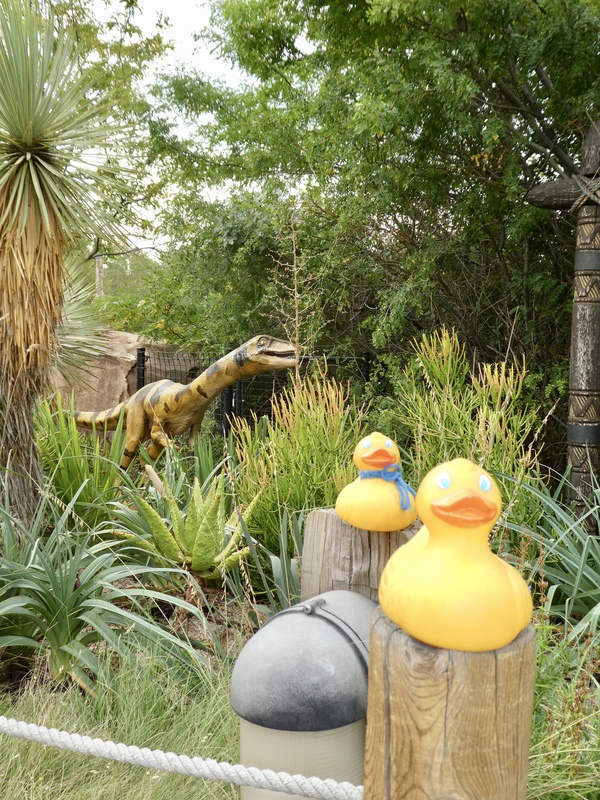 Ducks, let’s go to the zoo! Some of our favorite words. But what is this? 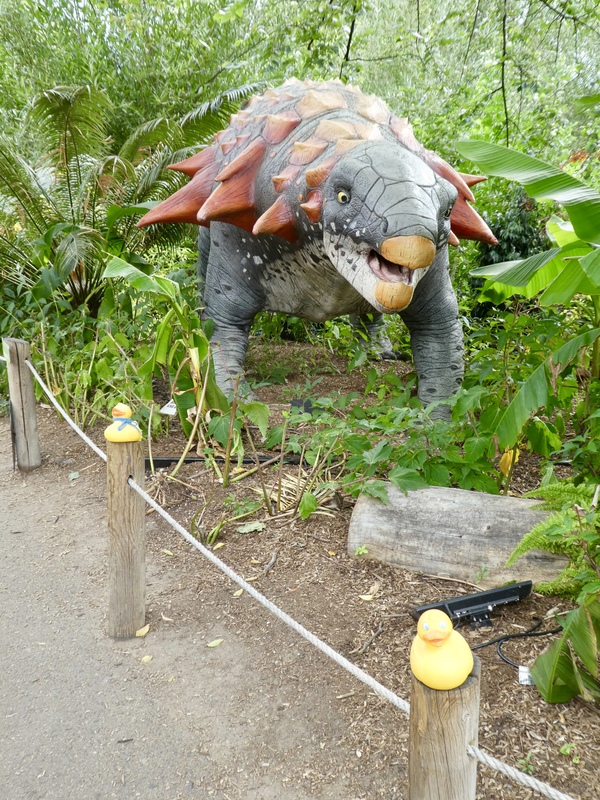 Dinosaurs at the zoo? Aren’t they extinct? Let’s look around here. 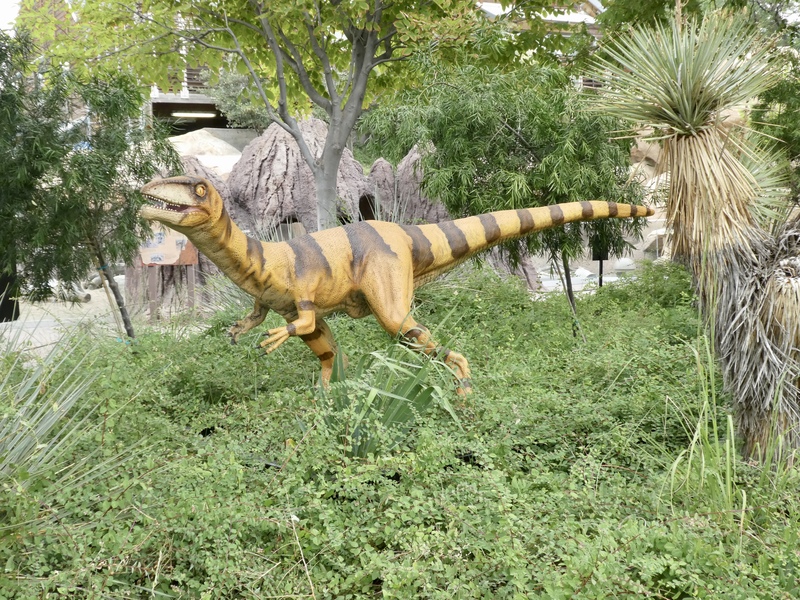 This is Coelophysis. Coelophysis is the earliest dinosaur known to have a wishbone (or furcular), a feature once believed to be unique to birds. They were social animals, living and hunting in groups. When you go to the zoo, be prepared. 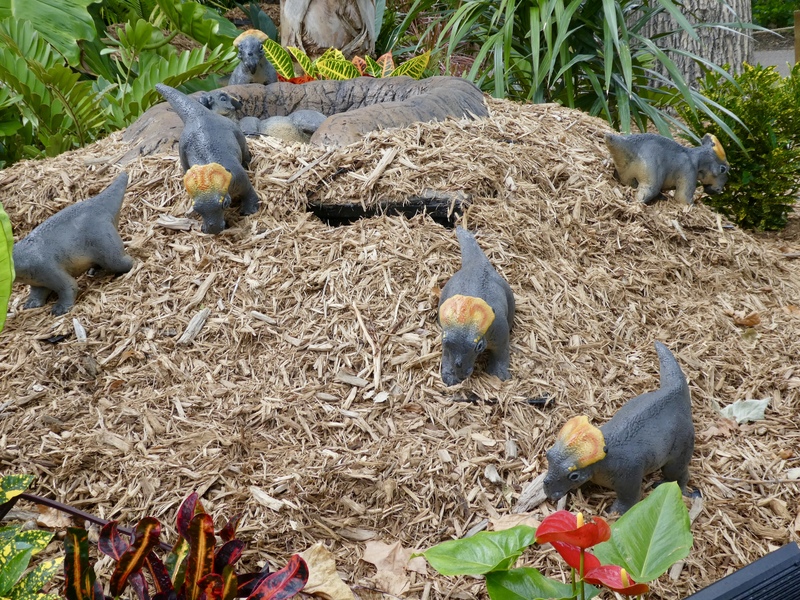 These dinosaurs move their heads and make a ferocious sound. You might be startled at first, we were. 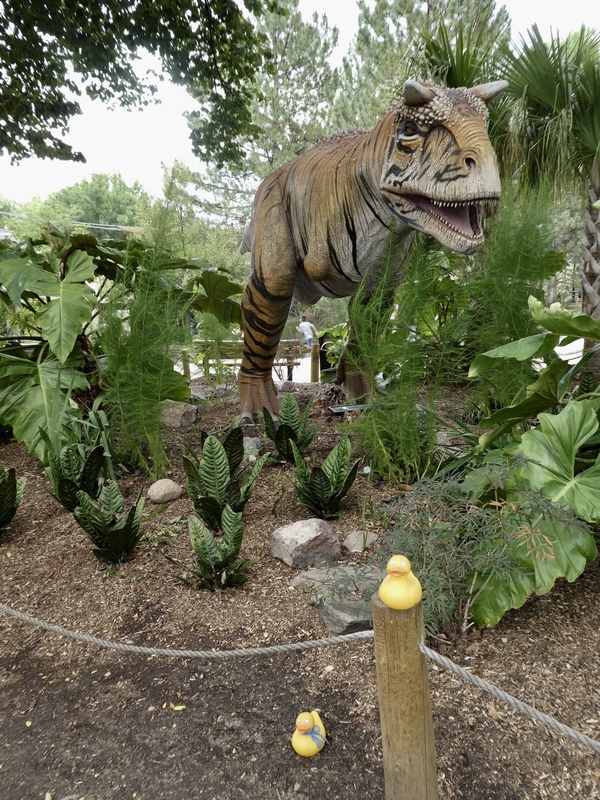 Next we saw Carnotaurus. Moving along, Edmontonia dinosaur was a sight to see. This dinosaur would have been a poor choice of prey for a predator due to the bony lumps, or osteoderms, that dotted its already rough hide. It is theorized that Edmontonia had a highly developed sense of smell, thanks to extensive nasal passages within the skull. Diabloceratops was the most unusual dinosaur we saw. Diabloceratops is estimated to have tipped the scales at roughly 4,000 pounds, the same weight as a modern Indian rhinoceros. 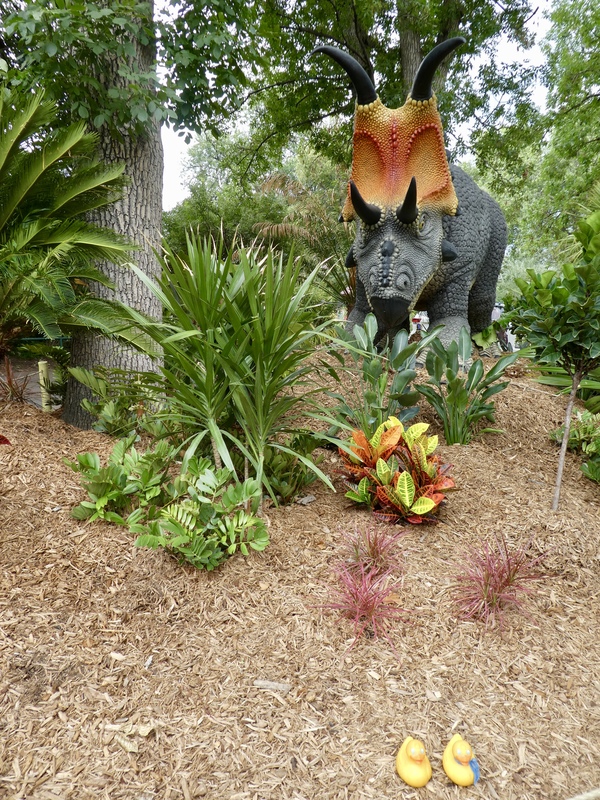 In addition, like the rhino, it was an herbivore despite its dangerous looking horns. About 79 million years ago, during the late Cretaceous period, Diabloceratops lived in Utah. Hey, that is less than 300 miles from where we live. But look at these baby diabloceratops. Aren’t they so cute? The last dinosaur we saw was Iguanodon. We learned that Iguanodon is one of three dinosaurs used as inspiration for Godzilla? The other two were T Rex and Stegosaurus. About 125 million years ago Iguanodon roamed around what is now Belgium in Europe. 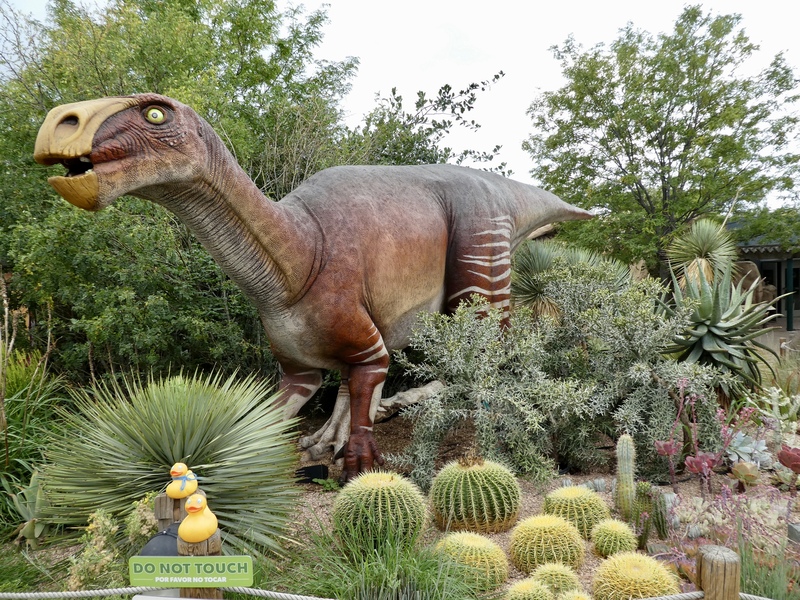 There are more dinosaurs for you to discover at the Denver Zoo. But don’t wait too long. After October 31, 2017 the dinosaurs will once again become extinct. 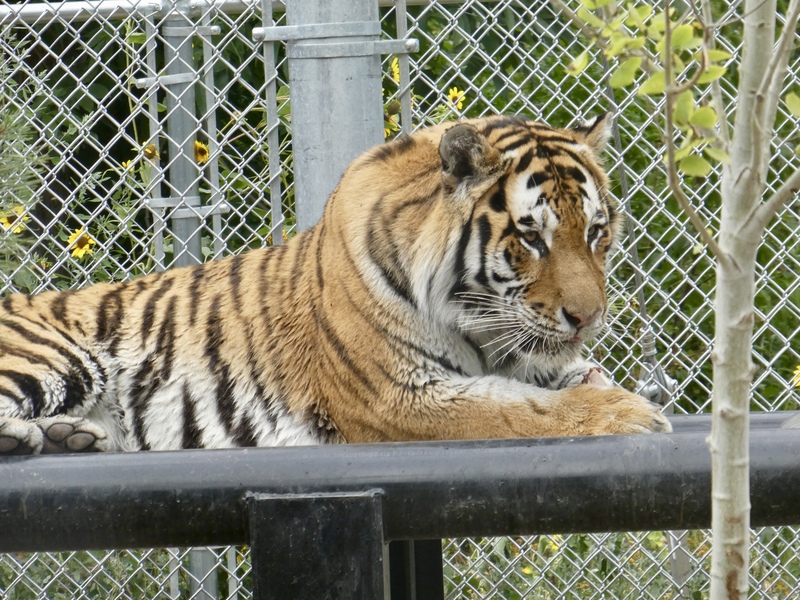 While we were at the zoo, we stopped to visit a few of our favorite animals. Mom just loves tigers. We like them also. The okapi is always interesting to us. 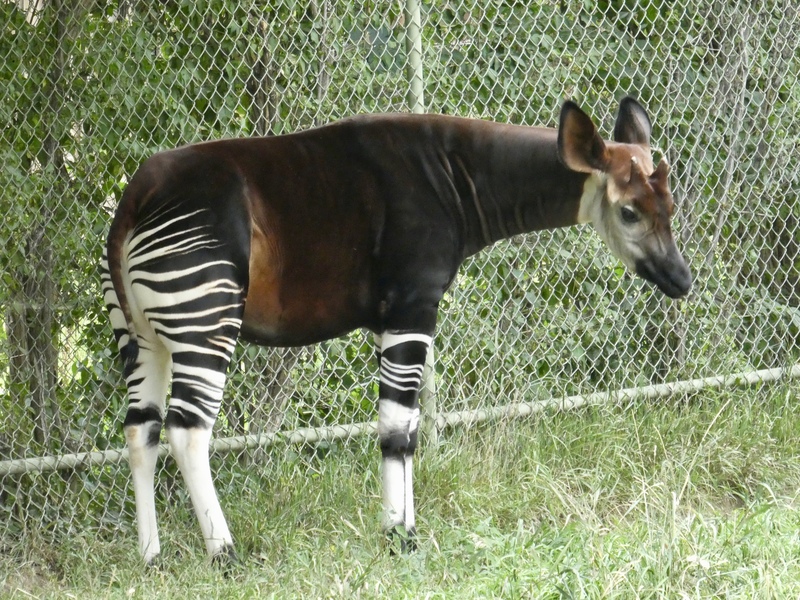 The okapi is a relative of giraffes and lives deep in the equatorial rain forests of Africa. Okapi can eat up to 65 pounds of leaves a day. That’s a lot of leaves! We love that the okapi only has some stripes. That makes him very unusual and favorite of ours. 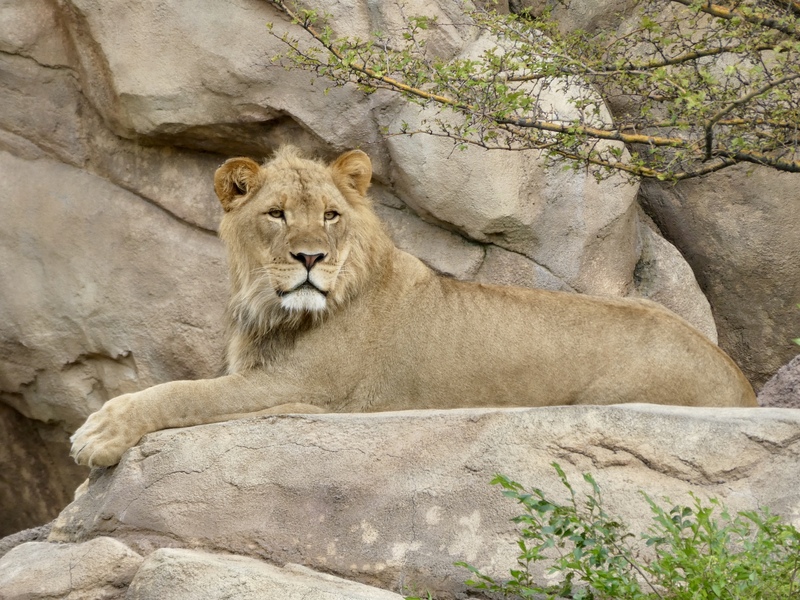 Of course, no trip to the zoo would be complete with seeing the majestic lion. And here is the fastest land animal on earth, the cheetah. The cheetah can sprint up to 70 miles per hour. Look at those eyes. 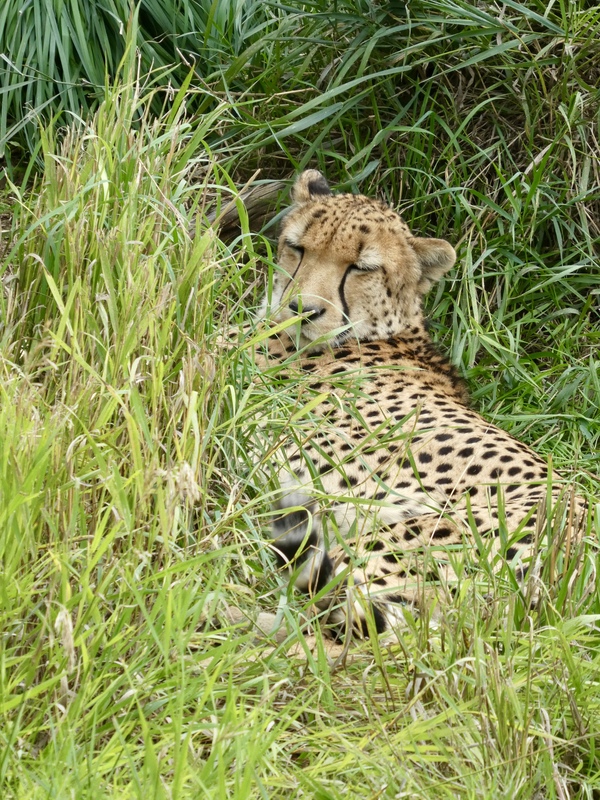 The sign said the black “tear marks” along the side of a cheetah’s nose may help reduce glare, just like the black grease some football players smear under their eyes. Is the cheetah a trend setter? Perhaps. 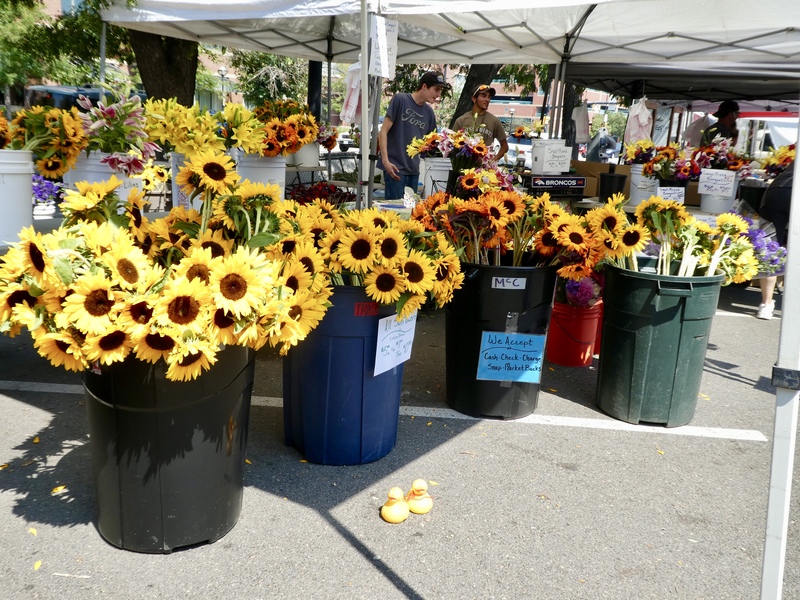 Two weeks ago, Labor Day Weekend in the United States, we went to the Boulder Creek Hometown Festival Even though Labor Day marks the official end of summer, we love this festival. First we headed to the Farmer’s Market. 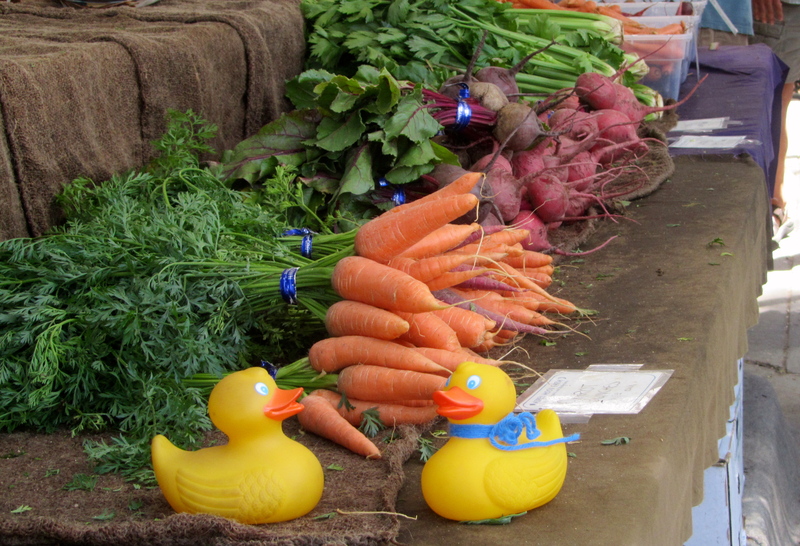 Don’t these vegetables look enticing? And, there is more. The flowers are beautiful. 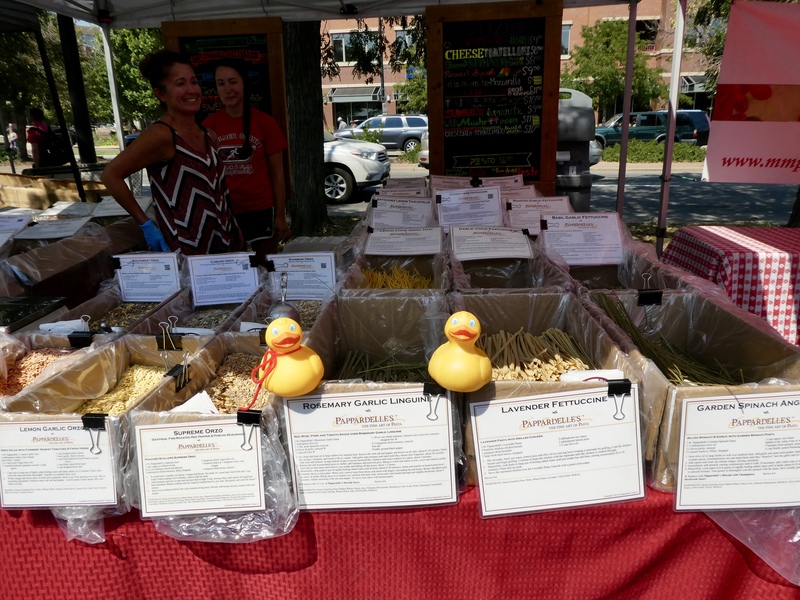 Pappardelles, The Fine Art of Pasta, had many types of pasta available. Makes us hungry just looking at them. 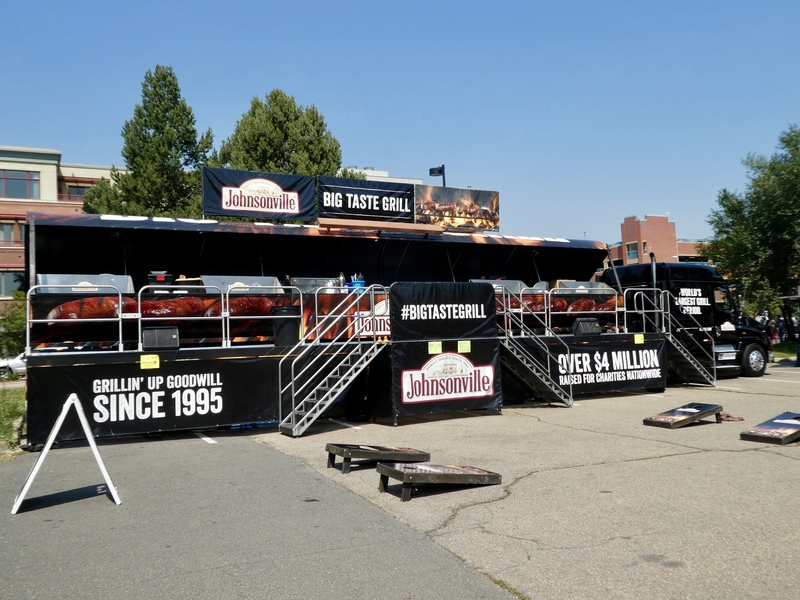 Next we saw the Big Taste Grill, a truck by Johnsonville. This is the world’s largest touring grill. It weighs 53,000 pounds, is 65 feet long and 6 feet wide. It can cook 750 Brats at a time, or 2,500 Brats per hour. 440,000 BTU’s are heat by propane fuel. Since 1995 the Big Taste Grill has been raising money for charities. The profits from this weekend are aiding victims of Hurricane Harvey that severely damaged Houston, Texas and surrounding areas. 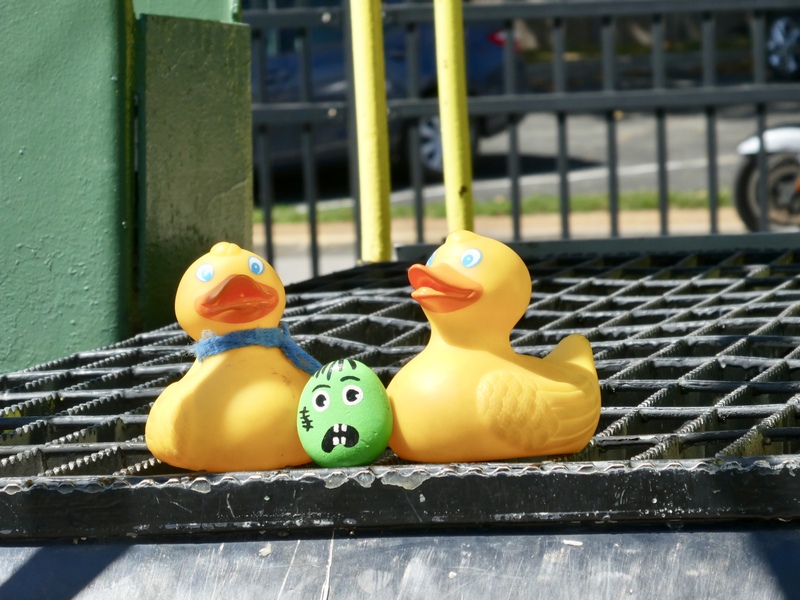 We ducks are on the stairs, ready for Brats. 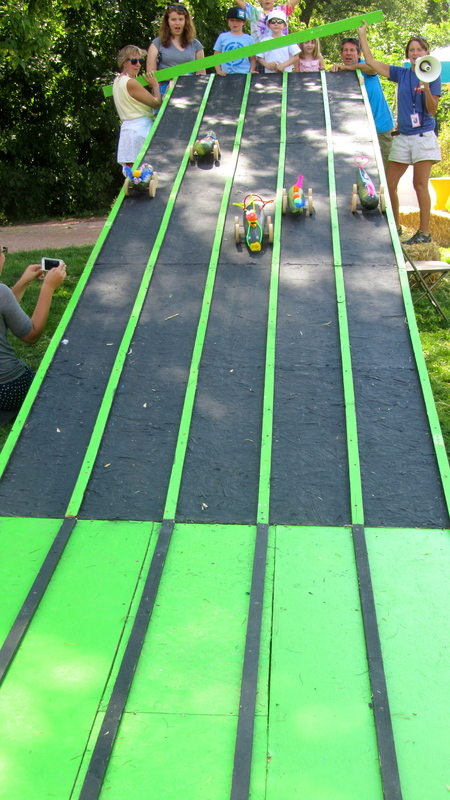 Festivals are great for kids to play. Oh, sometimes we wish we were human. Next we sampled ice cream. We love ice cream. What are these kids doing? It looks like so much fun. They can bump into each other. 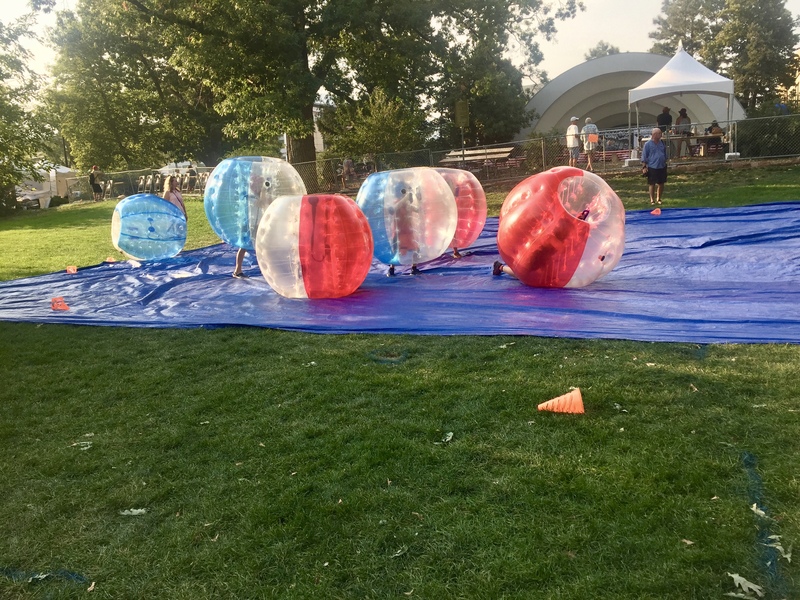 Of course, it is called bumper balls. End of summer means all gardens have too many huge zucchinis. What to do with them… Decorate zucchinis. 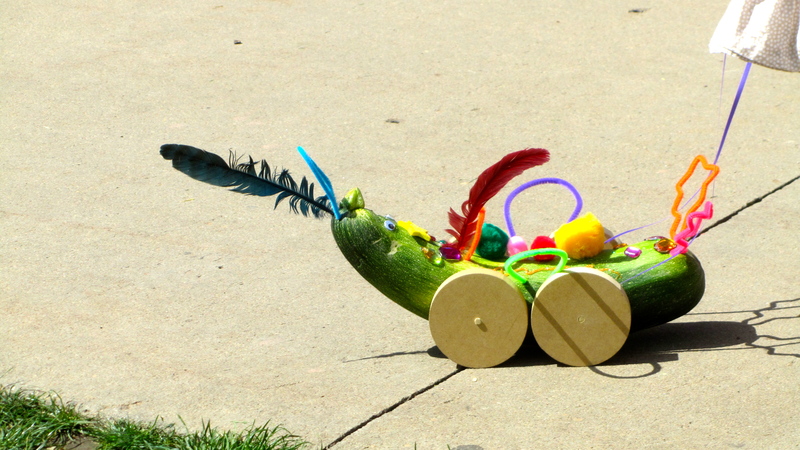 Then race the decorated zucchinis. You buy a zucchini and the decorations are there for you to decorate. Wheels first. After the zucchinis are decorated, let’s race. Such fun. 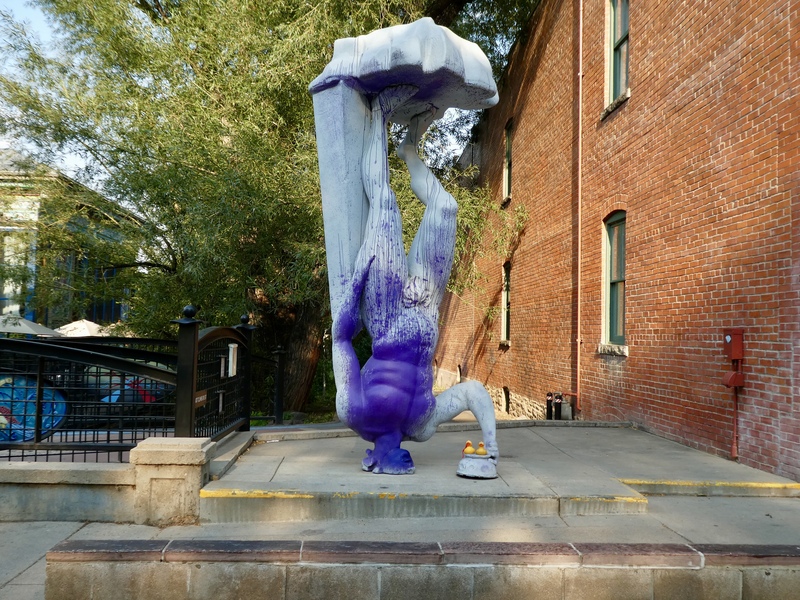 Next to the Boulder Museum of Contemporary Art we spotted this statue. Just not sure how to describe it, but it certainly got our attention. OK moms, let’s eat. 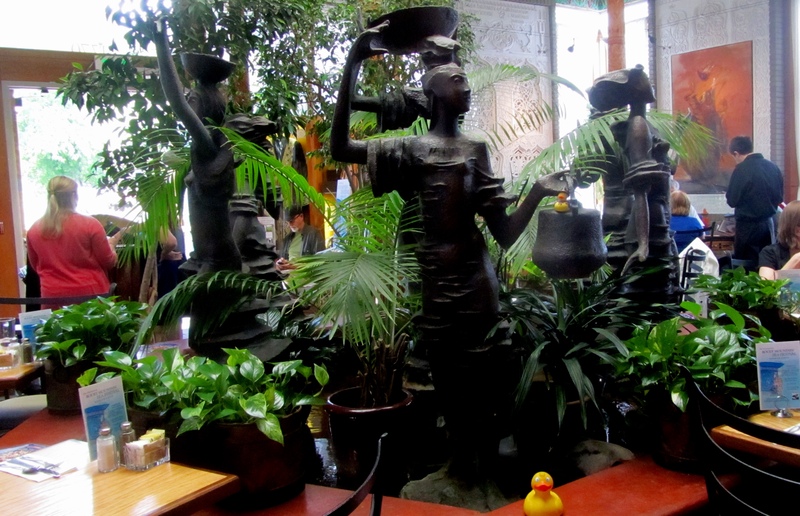 We love the Dushanbe Teahouse, also known as the Boulder Teahouse. This was a gift from Dushanbe, Boulder’s sister city in Tajikistan. 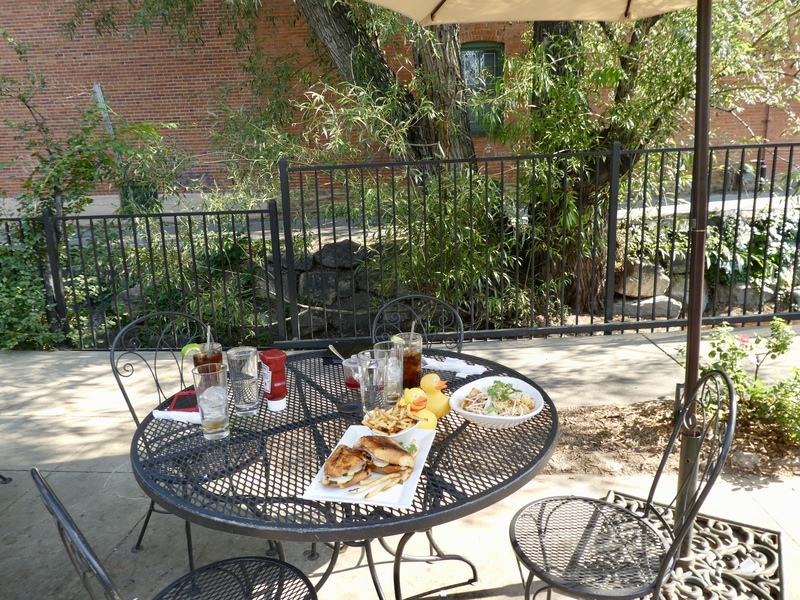 The teahouse is serene, located on the banks of the Boulder Creek and surrounded by beautiful gardens. 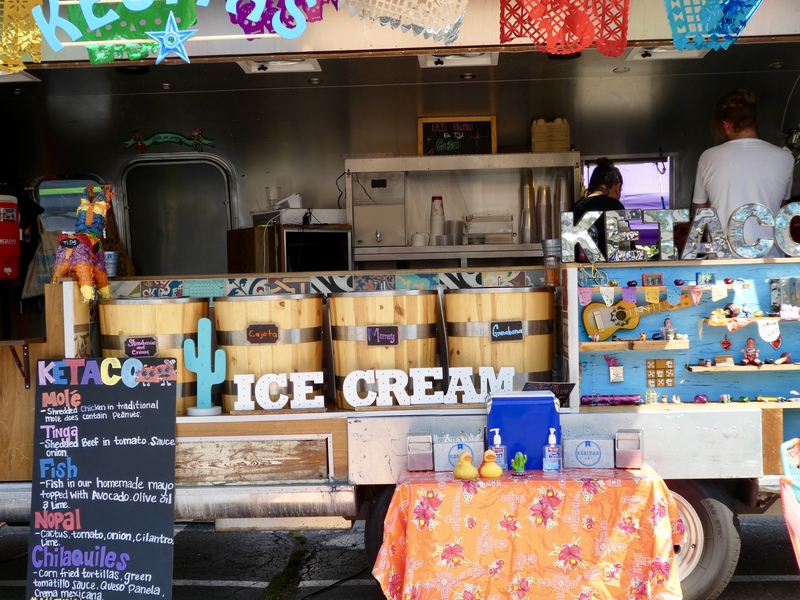 While eating, you hardly hear any of the activities of the Boulder Creek Hometown Festival. We ordered a Cuban sandwich and Indonesian Noodles with chicken. So very tasty. 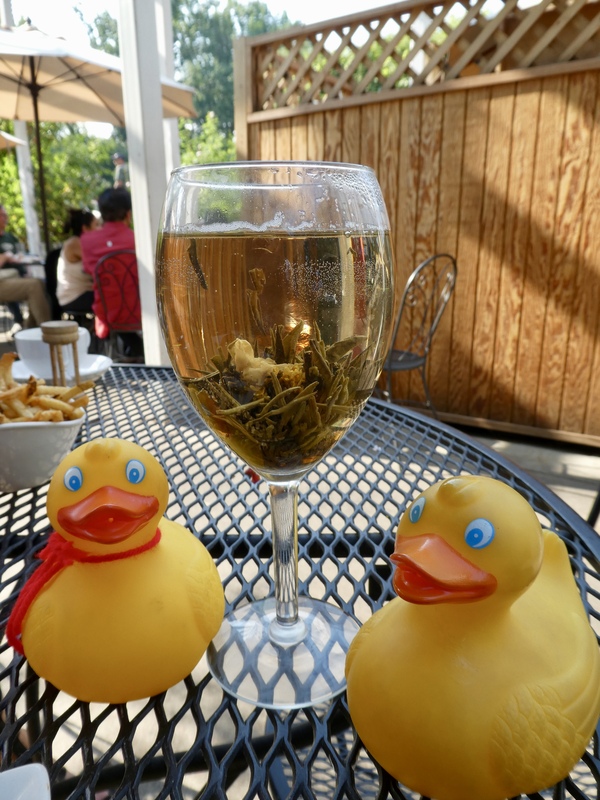 Since this is a tea house, we ordered a display tea. This is Jasmine Bouquet, a hand tied green tea around yellow chrysanthemum and jasmine buds. With the glass of hot water, we received the tea ball. Drop the tea into the hot water, and soon it will sink to the bottom of the glass. It was interesting to watch the tea ball open and the buds come into view. The display was fascinating and the tea tasted very nice. 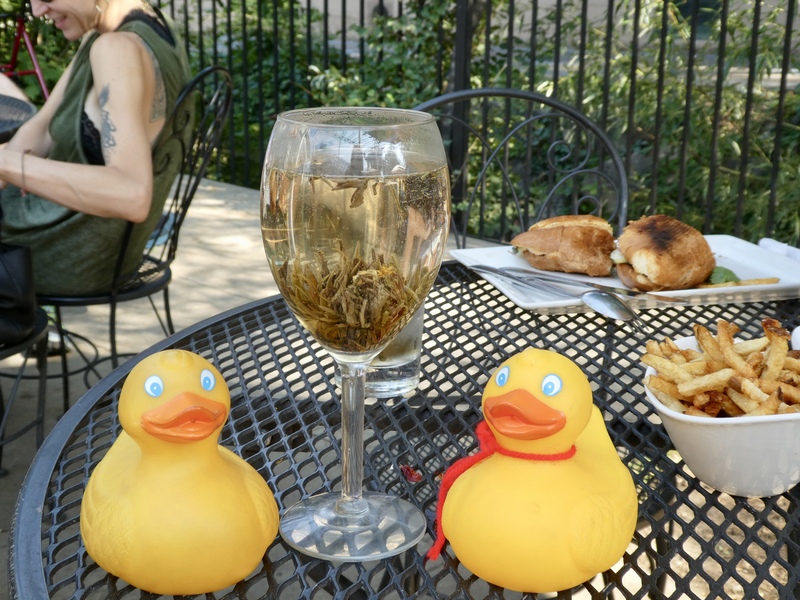 We do like green tea, so we were very happy. 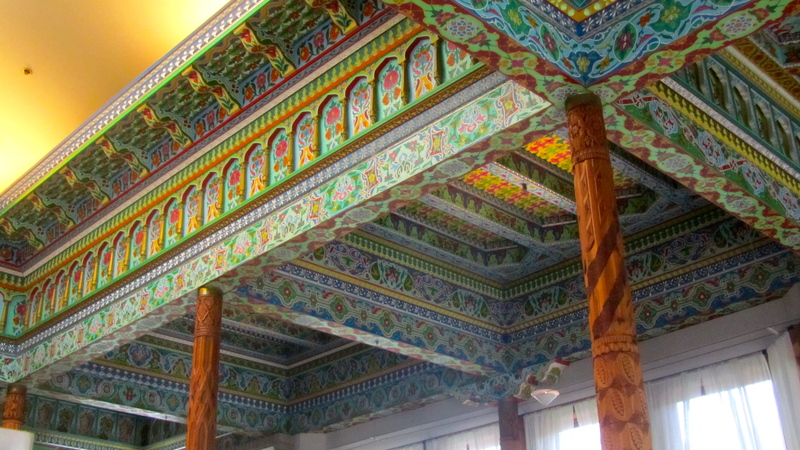 We also go to the Boulder Dushanbe Teahouse when there is no festival. Isn’t the inside beautiful? When inside, don’t forget to look up. Ceiling. Made by hand, no power tools. We really enjoy visiting this tea house. 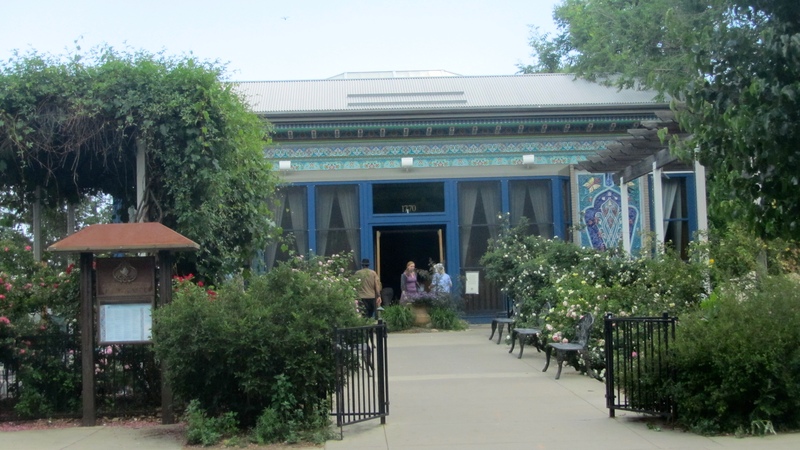 When in Boulder, Colorado, we hope you visit the Boulder Dushanbe Teahouse. 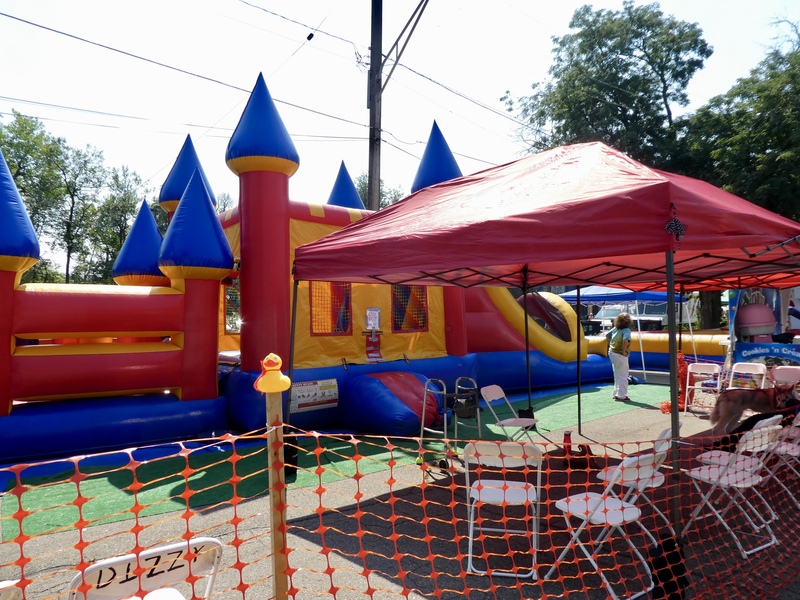 And don’t miss the Boulder Creek Hometown Festival the first weekend of September.